Last week we reported Mastodon's Brent Hinds had gotten served after the VMA's by some dude. 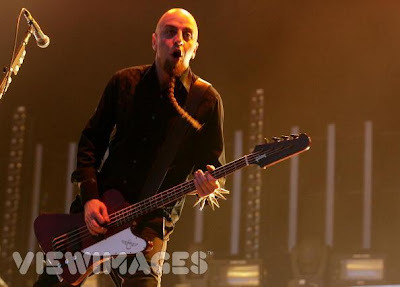 Turns out it wasn't Captain Ahab but Shavo Odadjian. Who? Oh, the zany diminutive bass player from System Of A Down. According to the police report, tensions ran high after Hinds began drunkenly “annoying” Odadjian and Hudson inside the Palms following the conclusion of the VMAs." According to a Metro police report, the September 10 fight that landed Mastodon frontman Brent Hinds in University Medical Center’s intensive care unit with brain hemorrhaging, a broken nose and two black eyes began as a skirmish between Hinds and Shavo Odadjian, bassist for multiplatinum metal band System of a Down. According to the police report—based on firsthand accounts and corroborated by hotel-security video footage—an inebriated Hinds was leaving Mandalay Bay around 3 a.m. when he encountered Odadjian and musician William Hudson at the hotel’s west valet area. Hinds took off his shirt and hit Odadjian with it, then struck Hudson in both the face and chest, prompting Odadjian to advise Hinds “to relax,” several times, according to the police report. The police report then indicates both Odadjian and Hudson punched Hinds in the face, knocking him to the ground. An unidentified friend of Hinds, who reportedly witnessed the event, rushed to the musician’s aid and apologised to Odadjian and Hudson, saying Hinds was “just drunk,” according to the police report. Odadjian and Hudson were both questioned by police on the scene.